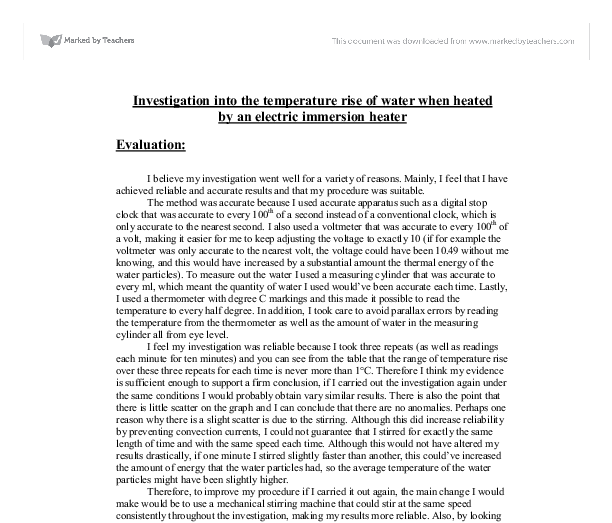 Investigation into the temperature rise of water when heated by an electric immersion heater (evaluation). 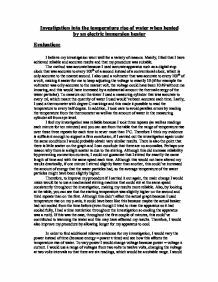 Investigation into the temperature rise of water when heated by an electric immersion heater Evaluation: I believe my investigation went well for a variety of reasons. Mainly, I feel that I have achieved reliable and accurate results and that my procedure was suitable. The method was accurate because I used accurate apparatus such as a digital stop clock that was accurate to every 100th of a second instead of a conventional clock, which is only accurate to the nearest second. I also used a voltmeter that was accurate to every 100th of a volt, making it easier for me to keep adjusting the voltage to exactly 10 (if for example the voltmeter was only accurate to the nearest volt, the voltage could have been 10.49 without me knowing, and this would have increased by a substantial amount the thermal energy of the water particles). To measure out the water I used a measuring cylinder that was accurate to every ml, which meant the quantity of water I used would've been accurate each time. ...read more. Although this would not have altered my results drastically, if one minute I stirred slightly faster than another, this could've increased the amount of energy that the water particles had, so the average temperature of the water particles might have been slightly higher. Therefore, to improve my procedure if I carried it out again, the main change I would make would be to use a mechanical stirring machine that could stir at the same speed consistently throughout the investigation, making my results more reliable. Also, by looking at the table, you can see that the starting temperature was slightly higher on the second and third repeats than on the first. Although this didn't affect the actual graph because I used temperature rise on my y-axis, it could have been like this because maybe the actual beaker had not cooled from the time before (even though I tried to rinse the apparatus so it had cooled fully, I had a time restriction throughout the investigation so cooling the apparatus was a rush). ...read more. the same. I would also keep the time variable constant at seven minutes (I feel this is suitable because it should be long enough to see a substantial change in temperature even at low voltages). To prevent convection currents I would use a mechanical stirring machine that would stir at thirty second intervals at a consistent speed (more reliable than stirring by hand) as well as the same apparatus as with the investigation I have just done (electric immersion heater, beaker, clamp stand, digital voltmeter, digital stop-clock, ammeter, power supply, heat resistant mat, thermometer with degree C markings, five wires, boss and 100ml measuring cylinder). I predict that if I carried out this investigation, I would obtain the same 'S' shaped curve because at first the electric heater itself would be heating up; then there would be a linear relationship (as the voltage increased, the power would increase so the energy would increase i.e. the water particles would be warmer); then lastly, the graph will begin to curve if the temperatures are high enough due to methods of heat loss. ...read more. This student written piece of work is one of many that can be found in our GCSE Green Plants as Organisms section. The Mann-Whitney U test, tests for the significance of the difference between two sets of data. In putting my data into this test it will tell me to what significance I can reject the null hypothesis, that there is no difference in abundance of black fly larvae, Simuliidae, between pools and riffles. measure the amount of water), stop clock (to time how long the heater has been heated for), glass rod with a coil wrapped around it which will be used as the heater. I predict that the amount of time the heater is heated for will be proportional to the change in temperature. Hot water in a immersion heater. - ammeter - digital voltmeter (accuracy to 100th of a volt) - power supply - 5 wires - water - boss - heat resistant mat - 100ml measuring cylinder (ml markings) Diagrams: Diagram showing all other apparatus before the heater is lowered into the water. An Investigation into Water Loss from Plants. They must be scientific so that they are accurate enough to pick up even the slightest difference in mass due to water loss so that the percentage of water lost can be found. The scientific scales can measure to 0.01g, which will make readings very accurate. which makes the layer positive (p-type layer) due to the lack of electrons. When the layers are sandwiched together, the area where they meet (junction) develops an electric charge as nearby extra electrons from the n-type layer fill nearby spaces in the p-type layer until they balance out.